If you are interested in increasing your motivation to use an inexpensive resource to improve your health then you have hit a gold mine with this book. It is a literal treasure house full of useful and very difficult to find information on the benefits of sunlight. If you have been successfully brainwashed by conventional medical wisdom into avoiding the sun then this book will help rescue you back to reality. It is chock full of useful information. I'll bet you never knew that over 100 years ago the Nobel Prize for medicine was awarded to a physician for his innovative use of sunshine in healing. Prior to antibiotics solariums were frequently used as the only effective alternative to severe cases of TB that would otherwise be sent to surgery. Dr. Hobday has created an important tool to help us understand the true value of proper sun exposure. I rarely find the time to write a review as I am the founder of one of the most visited health sites and that keeps me quite busy. I have extensively studied vitamin D and written many pages of the benefits of this commonly deficient vitamin on my site at www.mercola.com. This is one of the few books that I have read that really provide a land mark of useful information that is not easily available on the internet and was one of the most important books I have read this year. I could not encourage you more strongly to read this book. 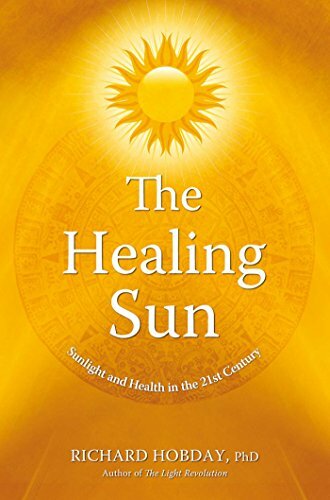 In The Healing Sun: Sunlight And Health In The 21st Century, Richard Hobday shows how the sun is central to human health and well-being. He explains that sunlit houses can help prevent disease, make us feel happier, and save energy; that sunlight can help prevent and heal many common (and often fatal) disease like breast cancer, heart disease, multiple sclerosis and osteoporosis; that sunlight was used successfully to speed up the healing of wounds before the invention of antibiotics; tanning moderately throughout the year is better than avoiding the sun altogether; sudden bursts of strong solar radiation are unnatural and dangerous, protection needs to be built up slowly, early morning sunlight in cool temperatures is particular beneficial to the body; sunlight hospital rooms provide a better environment for the treatment of clinically depressed people; prolonged exposure to artificial light puts the body under great stress; and much, much more. The Healing Sun is a unique and invaluable contribution to personal and professional alternative health and medical reference collections.